It is always a good idea to winterize your pool in order to protect your investment. However, if you own a spa, you might like to use it during the winter months. Here are some tips to help you get the most out of your spa during the winter season. Drain, clean, and refill before it gets too cold. 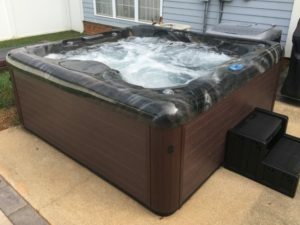 By cleaning your spa before the harshest weather arrives, you can avoid having to clean again until you are ready to re-open the pool in the spring. Maintain your temperature. “Boosting” the temperature is costly. It is more efficient to maintain your desired temperature than repeatedly raising and lowering the temperature with each use. Cover the spa. Make sure your spa cover is in good shape and holding heat when the spa is not in use. Consider using a solar blanket on the water’s surface to further prevent heat loss. Bundle up! Consider wearing a hat when it is cold or snowing to keep your exposed head warm outside the spa. Click here to learn more about adding a Highland Spa to your backyard oasis!